RIPARIAN IS DERIVED from the Latin riparius, meaning “of the river bank.” The term was historically used to describe the area of land lying adjacent to a body of water: primarily streams or rivers but also lakes. Riparian areas are ecotones—transition areas or interfaces between terrestrial and aquatic ECOSYSTEMs. As such, riparian areas possess features and processes influenced by adjacent ecosystems as well as those unique to riparian habitats. Historically, different disciplines and professions (fisheries biologists, forest managers, plant ecologists, soil scientists) have defined riparian areas in slightly different ways, emphasizing certain soil properties, plant species or communities or management goals as key characteristics. Common to most definitions, however, is that presence of water and its flow pattern or regimen—the hydrology of the system—is the key distinguishing characteristic of riparian areas. Water delivery, routing, and persistence in the soil help define the boundaries of riparian areas. Because of their position in the landscape, typically in valley bottoms adjacent to streams, riparian areas receive surface water from upland runoff and stream flooding and from subsurface groundwater flows or saturated soil horizons. Riparian areas typically have soils that are saturated by water for at least part of the growing season. Soils in riparian areas can vary over short distances and often form a moisture gradient consisting of saturated hydric soils along streams to moderately well to well-drained soils above stream level. Decomposition rates of organic materials (leaves, branches) vary with soil moisture in riparian areas. Decomposition is generally slower in saturated soils than in drier soils owing to cooler temperatures and reduced oxygen availability. Riparian soils are often relatively fertile due to nutrient runoff from adjacent uplands and deposition of nutrient-rich alluvial sediments by flooding. Riparian definitions have evolved over recent years to include multidimensional considerations of ecological structure and function—an ecosystem or landscape perspective. In this regard, riparian areas are defined as three-dimensional, linear ecotones that extend longitudinally along streams and rivers, vertically from the groundwater zone below the stream channel to the vegetation canopy above, and laterally from the stream bank through the FLOODPLAIN to adjacent uplands. The width and boundaries of riparian areas are variable, influenced by the size of the water body they flank and the geomorphology of the landscape in which they are embedded. In general, riparian areas increase in width with increasing stream size and valley width and are constrained by steep slopes in mountainous areas. Thus, riparian areas along geologically constrained headwater streams in a watershed tend to be narrower in width than those along lower-elevation, low-gradient, meandering reaches at the watershed’s base. Riparian areas are among the most diverse, dynamic, and complex ecological systems in the world. The functional processes and linkages that forge riparian dynamism are a function of the interaction of aquatic and terrestrial ecosystems. 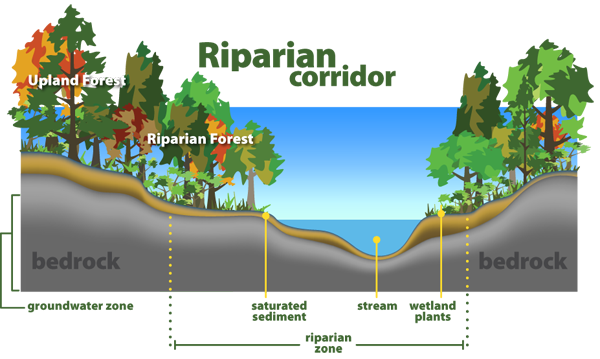 Vegetation best illustrates the ecological linkage of aquatic and terrestrial ecosystems in riparian areas. Plant species diversity is often high in riparian areas because the mosaic of soil types and stream flooding disturbance (particularly scour) creates a range of soil and site conditions that favor coexistence of many different plant species in a small area. Riparian vegetation in turn influences aquatic ecosystems by shading stream channels and regulating water temperatures, by providing leaves which form the base of the stream food web, and by the input of large woody debris (logs), that affects water and sediment movement and molds in-stream habitat for aquatic organisms. Riparian areas have important ecological functions in the landscape and are valued as buffers that protect and enhance water resources. Riparian areas may act as filters of sediments and nutrients from uplands, transformers of toxins, nutrients, and microclimate, sources of species and energy, sinks for excess nutrients, and as habitat and movement corridors for organisms. Worldwide, riparian areas have been degraded by deforestation, grazing and urban development. Recognition of the important ecological functions of riparian areas has stimulated efforts to restore and enhance these diverse and dynamic systems in many areas of the world.